To keep your HELIOS software current, HELIOS Software GmbH offers the “Software Upgrade Service Agreement” option, which provides both product updates and upgrades. Updates include bug fixes, 3rd party compatibility patches, and product enhancements, and are released on an on-going as-needed basis. Updates are available for download from the HELIOS Support website to authorized users. HELIOS products include free updates (not version upgrades) for a 30 day period after purchase. Thereafter, updates are available to those who subscribe to the HELIOS Software Upgrade Service agreements (SE002/​SE003). Customers with Software Subscriptions agreements (SE005) are entitled to install the latest updates and upgrades. Upgrades are major new product versions. They are available via download from the HELIOS media library. Upgrade notifications are automatically sent to customers with current Software Upgrade Service agreements, at no additional charge. Detailed information about these Software Upgrade Service agreements are available in the “Media Library” of the HELIOS Symphony customer portal, in the “Forms” section. Product SE002 allows access to the HELIOS update download area on the internet, and it lets the customer receive product upgrades free of charge. Software Upgrade Service agreements must be purchased together with the product purchase. Each HELIOS product requires a Software Upgrade Service agreement (e.g. Universal File Server and ImageServer will need a service agreement covering both products). SE003 allows switching to a backup server hardware. It is an option for the SE002 software upgrade service and includes additional backup for the base license and all its user expansions. Backup for optional HELIOS add-ons (e.g. ImageServer, PDF HandShake, PrintPreview) is covered, too. Separate standard software update service agreements for ImageServer, PDF HandShake, and PrintPreview are recommended. For other products SE002 is sufficient because all add-on products are linked to the file server product and do not require cold spare licenses. Customers not taking part in the upgrade service will only receive product updates (but not version upgrades) within 30 days after the software purchase. Customers can still upgrade their software when new major releases become available, by purchasing the upgrade to the latest version. HELIOS will inform all customers who do not have an upgrade service contract about fees for upgrading existing installations as soon as new releases become available. Pricing information and the relevant application forms are available in the HELIOS Symphony customer portal (symphony.helios.de). To view a list of all HELIOS modules and their update levels, log on to HELIOS Admin as a user with “SysAdm” privileges, and select Versions on the Lists menu. If you need information about a certain update or update level, please check the HELIOS CD or the HELIOS website: www.helios.de. Alternatively, if the HELIOS services are already running on your server you can use the “uwhat” utility (see 8.22 “uwhat”) to get information about the current update level of the HELIOS modules. For example, the entry “afpsrv 6.0.0u1XYZ” indicates that the HELIOS update u1XYZ is already installed. 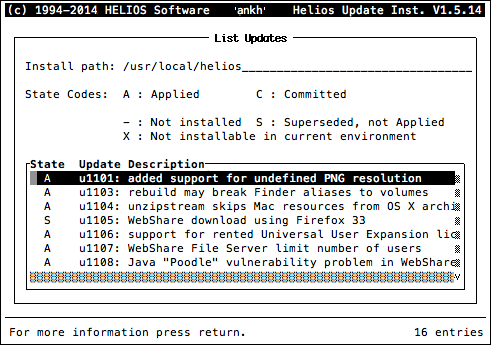 “uwhat” does not display updates in the way HELIOS Update Installer does. Thus, it is more reliable to use HELIOS Update Installer (options List Updates and List History) for precise information about the update level on your server. HELIOS Update Installer is described below. 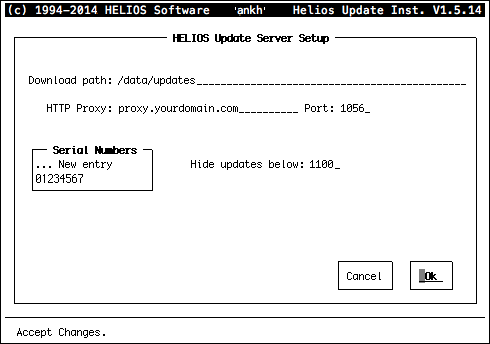 Authorized users can download new HELIOS updates from the HELIOS Update Server via HELIOS Update Installer. Check the support section on the HELIOS website for detailed update descriptions. 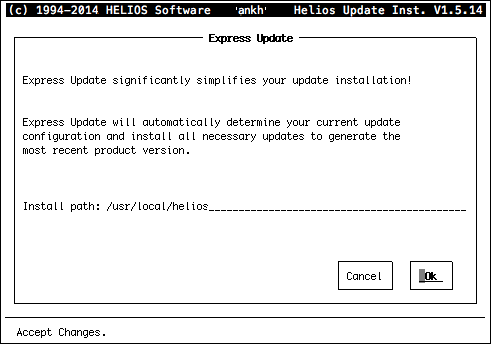 To install updates, we strongly recommend using HELIOS Update Installer. The tool is able to find and install all updates that are required for a particular product and to check interdependencies of certain updates. The installer is easy to handle and can also be used to retrieve information about updates or to uninstall a particular update, if required. The items in the main menu can be selected by typing the first letter. E.g. typing “s” will highlight the Setup item. For detailed information on navigating within HELIOS Update Installer read the instructions in 4.1.6 “Navigating within HELIOS Installer”. 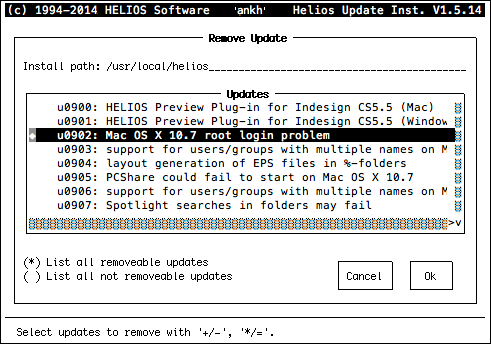 Operating HELIOS Update Installer is almost the same as operating HELIOS Installer. The ESC key (Ctrl-X) always lets you return to the start-up window and the main menu. Express Update will induce the installer to automatically perform the installation of all available updates for all installed products. Custom Update lets you select the updates you want to install. Remove Updates allows you to uninstall certain updates. Commit Updates removes backup files and makes updates permanent. Usually, if you install an update, a backup file of the old version is kept. This allows you to uninstall the update in case of problems and to return to your initial installation. If new updates work fine you may want to remove the backup files. This can be achieved by using the Commit Updates option. Download Updates lets you download the required updates from the HELIOS Update Server via the Internet. List Updates lets you list all available updates, and can also be used to display the update info texts that describe the purpose of the respective updates. List History gives information about the date of previous update installations. The list tells you who did what, and when they did it. Setup allows you to set preferences, e.g. change the language setting or change the search path. The latter can be necessary if you move the update files to another directory or if you have the HELIOS CD and additional update repositories. The HELIOS Update Server settings allow you to define a download path, and enter serial numbers. Note that HELIOS Update Installer does not automatically stop the HELIOS services, because this is usually not required. However, to avoid problems, we recommend to stop all printer queues before starting to install updates and to stop and restart the HELIOS services (commands “stop-helios” and “start-helios”, respectively) some time after the update installation to make the newly installed modules available. 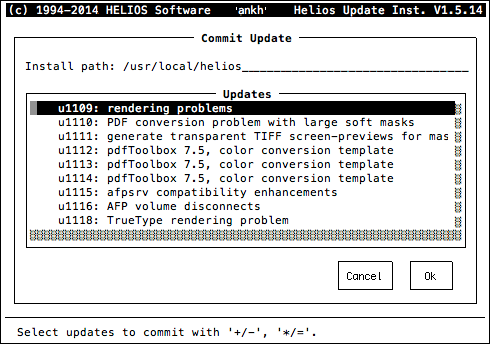 You must stop the HELIOS services before you select the Commit Updates option. Otherwise, serious problems can arise. To install new updates, you should always open the “General setup” dialog first and check whether the update search path is correct (Fig. 18.2). If you have to replace the path entry, use the BACKSPACE key to delete the old one. You can enter several search paths at a time, in case you have different updates repositories. In Fig. 18.2, for example, we have defined two search paths which are separated by a “:”. The “HELIOS Update Server Setup” dialog (Fig. 18.3) lets you specify a path (Download path) where the downloaded updates are saved. Additionally you are asked for the name of the HTTP Proxy server you want to use, and its port number. In the Serial Numbers section enter the product serial number or the code of each product for accessing the HELIOS Update Server. “HELIOSDIR/​etc/​updates” should not be used for the Download path. It is solely under the control of HELIOS Update Installer. Use a separate directory for the update download area, e.g. : “HELIOSDIR/​download/​updates”. This directory can then be used at the same time for the Update search path (“General Setup” window). If invalid (or no) serial numbers are entered, only the update descriptions can be downloaded, but not the updates themselves. Your current update level can optionally be entered in the Hide updates below field so that only newer updates are downloaded. Do not specify a larger number because interdependencies need to be checked! The “List History” window (Fig. 18.5) reveals the product update history for the specified path. Select the Download Updates item from the main menu. The “Download Status” window shows the progress of the update loading process (Fig. 18.6) and disappears automatically when the loading has been completed. At this point, update description files have been downloaded to the specified directory. Next, relevant updates for each product are displayed and can be selected for download. In the “Download from the HELIOS Update Server” dialog (Fig. 18.7) select from the (Architecture) pop-up menu the required architecture. In the Update-Description section select and mark the update for download according to the instructions given in Custom Update. You can mark more than one update at a time. As soon as the download is complete, an information box appears, which states the number of updates and the directory where they have been saved to. HELIOS Update Installer uses the standard HTTP port (80) or, if configured, the proxy server port number for downloading updates from the server. This information may be important if you set up a firewall on your system. The easiest way of installing these downloaded updates is to use the “Express Update” dialog (Fig. 18.8). 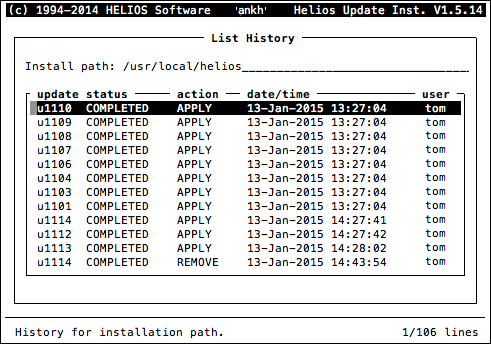 The correct Install path is detected automatically by the HELIOS Update Installer. The installation will be performed automatically when you confirm with the Ok button. In contrast to the Express Update item you do not just select the Install path entry, but each single update you want to install (Fig. 18.9). The correct Install path is detected automatically by HELIOS Update Installer. However, it is possible to overwrite the path entry. As soon as the installation is complete, you will be notified that all updates have been successfully installed. Commit Updates removes previous update versions. Make sure to issue “stop-helios” and “start-helios” before committing updates. In the Updates section of the “Commit Update” dialog (Fig. 18.10) select and mark the update you wish to commit according to the instructions given in Custom Update. You can mark more than one update at a time. After you have committed an update, there is no simple way, apart from reinstalling the product, to fall back to a previous version. An Information box appears stating that the committal has been successful. Some updates change the behavior of certain product modules. To uninstall updates you do not want to work with, use the Remove Updates option. The respective dialog window is shown in Fig. 18.11. There may be interdependencies between several updates, i.e. certain updates cannot be removed as long as they are required by other updates that are still installed. The dialog window displays either all removable or all non-removable updates. Updates you have already committed can no longer be removed.